When painting and sketching no amount of copying photographs will be as exciting and vibrant as the few scribbles and marks on a piece of paper that happen after a period of direct observation of birds, animals and wild landscapes. Copying enables detail to be conveyed, but to my eye it tends to depict moments with all their three-dimensional sense of tension and immediacy flattened out - even if they are your own photographs! I believe it makes it more difficult to convey fleeting moments and snatched personal interpretations of the hidden truths in living species and places - movement, the relationships between colours, forms and lines, or a sense of tension that suggests something is about to happen, for example. For me the starting point has to be the field experience as pure observation is the raw material that starts every creative journey. Besides, it is much more exciting and fun to be out there with the wind in your face hearing the sounds of nature and watching and noting down the activities of species and experiencing wild places - rather than being indoors surfing the web, leafing through magazines or trawling a personal photo archive for an idea. 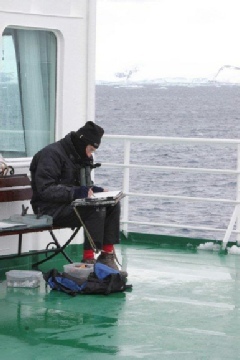 Well, that is the theory; so how would it apply to being invited by One Ocean Expeditions to join the expedition ship Akademik Sergey Vavilov as ‘artist in residence’ on a recent 18-day voyage to The Falkland Islands, South Georgia and Antarctic Peninsula? The result was an artistic journey way beyond all my expectations - either working with the enthusiastic amateur painters onboard encouraging them on different creative adventures suggesting ways to see the natural world in a new and challenging light, or sitting for longer with others who were picking up a pencil and seriously drawing for the very first time. Other times we gathered for communal art events formally announced throughout the ship as ‘for anyone wanting to have a go’. So whenever the opportunities arose we sat in the lounge with sketchpads and pencil exploring the mechanics of penguin and albatross wings completing impressions of the effortless flight of seabirds and swimming penguins. 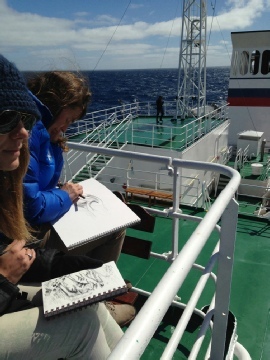 When the weather clear and the sea calm, we sat on the upper deck and painted seascapes and tried to understand the colours of the ocean. 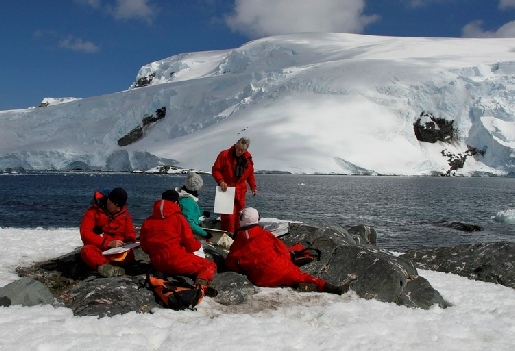 And ashore, among the snow and penguins, we painted the wildlife and vast frozen landscape of rock, mountain and ice. Sometimes a handful of passengers gathered for the ‘art club’ and at other times there were only just enough sketch pads and pencils to go round. And for the lecture Artists in Antarctica – 1770 to Contemporary the presentation room was almost full. And at every other opportunity I sketched and painted on my own gathering new sketches and ideas for developing work later in the studio. Sometimes I had all my kit laid out on the heaving aft-deck under a continuous feint rain of salt spray and mist; other times out of the wind under the shelter of the port or starboard lifeboats. There were times when I worked close to the lounge door opening onto the deck benefitting from the frequent blasts of warm air every time someone came or went; sometimes the views from high on the bows of the ship were what I wanted where two huge mooring points served as tables. Other times I was trying to capture the colour and motion of towering waves, other times noting the plumage characteristics of passing albatrosses and petrels. 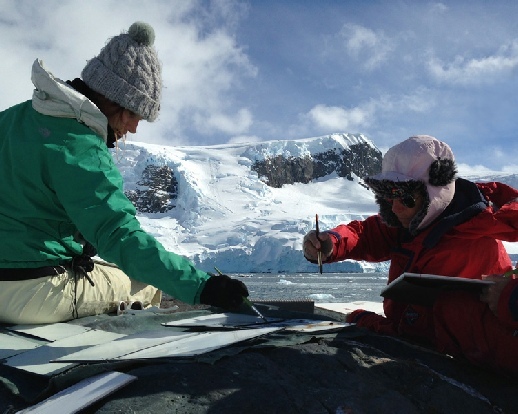 Sometimes painting on huge sheets of paper as the ship nudged through fragmented icebergs, or other times in Zodiacs with a tiny sketchbook and a handful of coloured pencils ready as we manoeuvred almost silently towards seals or whales. The next voyage? Perhaps a few more pencils, some additional charcoal and plenty more large sheets of drawing paper. However, just like the last voyage, what there is sure to be enough of is an enthusiastic mix of artists with a range of talents prepared to have a go. But however many of us gather onboard we will almost certainly be outnumbered by photographers!